It’s a Saturday night in downtown Portland and we are getting ready to go hard. The streets are filled with bar goers and party hoppers, the atmosphere is loud and boisterous; It’s the perfect time to get out. Except, we aren’t about to go hard to the point of stumbling out of the local brewery down the street. Oh no, we are gearing up to go hard on the mountain like it’s 1971. When the phone alarm goes off at 12:30am, I’ll admit the first reaction was not one of exuberant joy. Thoughts and fantasies of summiting had kept sleep away all night and it felt as though when I was finally drifting off… the alarm decided to ring. Half asleep and delirious we loaded the car with our gear, which was packed from the night before (never try packing in the morning, almost guaranteed you’ll forget something) and began the drive to Mount Hood. The Norwest is spoiled. Not only does the Cascade Range divide through several of the states yet there are amazing geological features dubbed the Cascade Volcanoes. 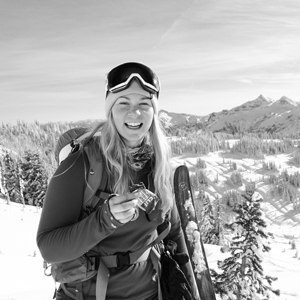 Thirteen skiable volcanic peaks over 9,000ft exist between Oregon and Washington alone. 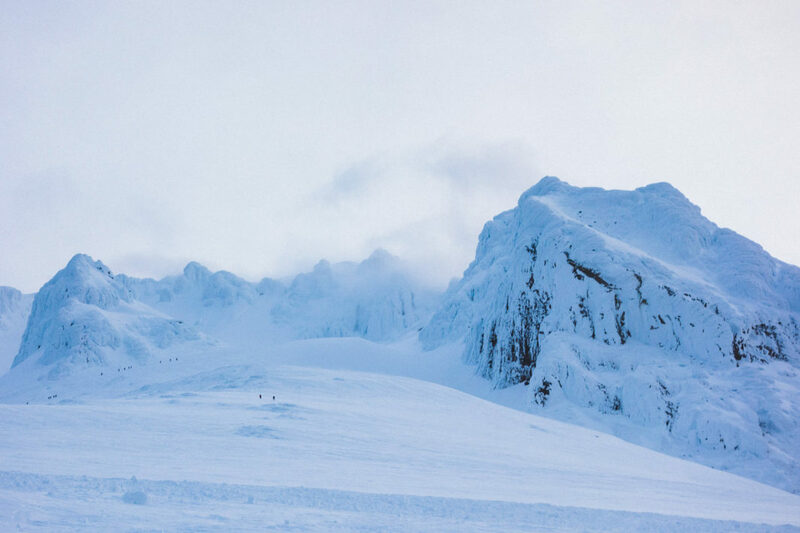 With several ranges in North America having numerous peaks far exceeding 9,000ft one may wonder why skiing a Northwest volcano is a noteworthy adventure. 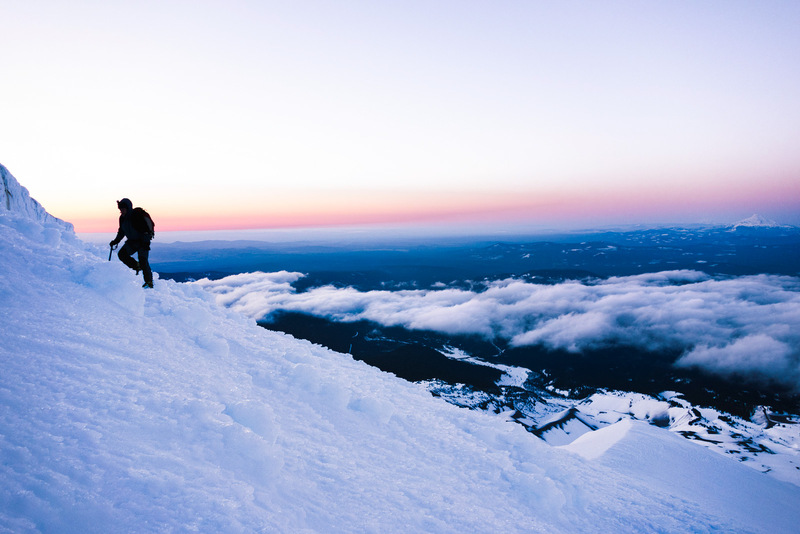 Among other reasons, our destination of Mount Hood is the highest point in Oregon with a summit at 11,239 ft. The towering peak looms over the nearby city of Portland who rests at a mere 50ft elevation. No, that’s not a typo. With such an elevation difference, being atop Mount Hood makes one feel like they are touching the sky. However, such a unique and beautiful reward doesn’t come without a true sufferfest. 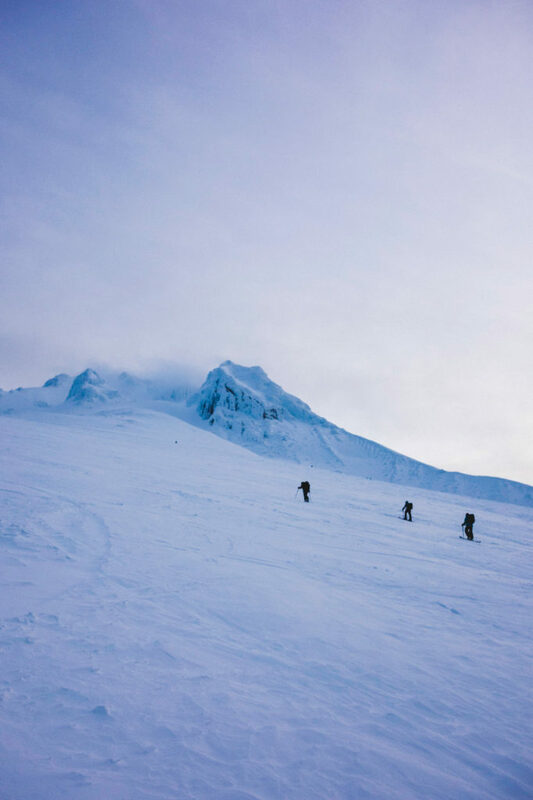 A word to the wise, if planning a ski summit of Mount Hood, you had better be prepared. Although easily accessible, it is still a mountain. The work begins a few days before the adventure. 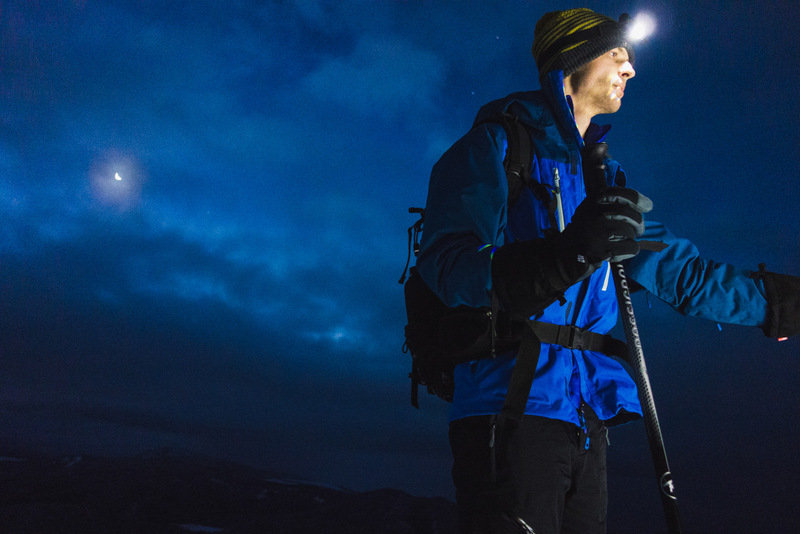 Checking weather patterns and snow conditions when planning a climb of Hood is crucial. Important factors include precipitation or snow accumulation over the last days as well as the coming days, temperature changes, if the bergschrund is open, the wind speed and more. All these topics are important for various reasons but checking the wind is always a top priority for me. Icy wind blows across our route as the sun shows its first light. With no neighboring range to block or protect it, it’s not uncommon for the exposed sides of the mountain to get hit with whipping and brutal winds. Additionally, the temperature change is an important piece to pay attention to in terms of timing. If one begins their climb too late in the evening, the snow will be soft by the time the climber approaches the ice climbing section, which would then increase the likelihood of rock fall and other hazardous conditions. However, if one begins too early, the risk is reaching the ice when it is too cold to use tools, or alternatively the snow is crusted and iced over for the ski descent. Timing is a delicate balance. Typically, in the late winter months, my partners and I plan to leave Portland by 1am and begin our approach around 3am (In the spring, as temperatures increase, we will start climbing earlier around 12am). The approach is a complete slog. Almost immediately out of the treeline all one can do is stare at the mountain. The feeling is that of being on a treadmill; so much work for what feels like no progress. With an unchanging scenery and darkness all around, I often find myself in a zombie trance skiing up the climber’s route. Just starring at the snow in front of my skis as they slide along. Sometimes I’ll ponder stresses or life thoughts, but most the time I’m just on autopilot. After roughly three hours in the zombie zone, the sunrise begins to creep over the mountain and my body starts to register what the hell I’m putting it through (again). The winds whip hard as light begins to flood the surrounding landscape. Finally, as I look ahead, the summit feels closer and attainable. The group’s anticipation kicks in and excitement begins to fill our minds, registering in our pulse. At this point is when a notable moment occurs on the mountain; the shadow appears. 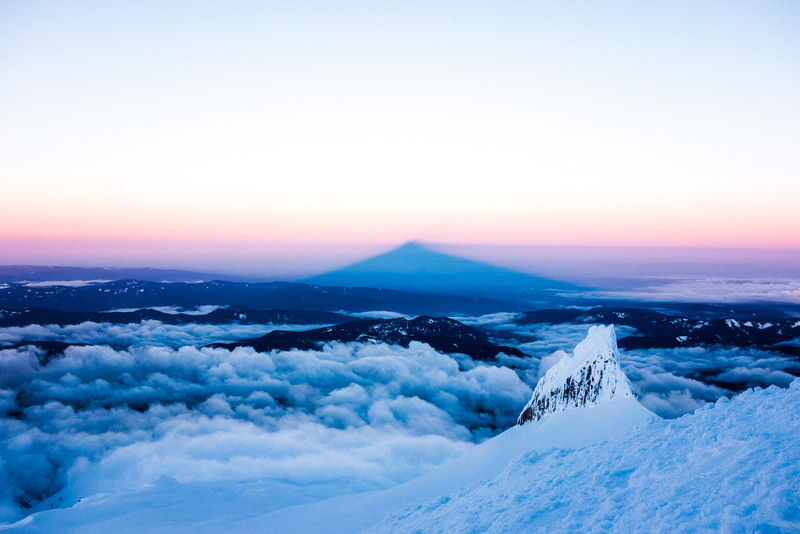 Being the tallest unchallenged point for miles, during sunrise the mountain casts an unparalleled shadow the makes a perfect triangle on the landscape below. It is truly a remarkable sight. As the sky bursts with pink and purple, the ice towards the summit and on the Pearly Gates glows with a luminescent blue. Normally at this point, the group transitions from skins to crampons and pulls out ice tools. The goal timing is to reach the Hogsback and begin the approach of the Pearly Gates right as the sunrise is creeping over the mountain. Therefore, the ice should be ideal for climbing up and down from the summit followed by a smooth, soft snowpack for the descent. Although not a technical summit, having two ice tools is handy. I’m not an ice climber, so when on a nearly vertical face of icy nubs I like the stability of two tools. There is a quick section of ice climbing that does not necessarily require roping in, but if one slips they best know how to self-arrest as the bergschrund is not far below. The Pearly Gates is one of the most popular and picturesque approaches for Hood’s summit. Once through the gates it is a quick traverse across the ridgeline and we’ve officially reached the tallest point in Oregon. On a clear day, one can stand on Hood and see neighboring volcanoes in the far off distance: Mount Adams, Mount Jefferson and Mount Saint Helens. The option of skiing directly off the summit is possible. However, I prefer to leave my skis below the Pearly Gates to avoid the added weight and difficulty while ice climbing. Therefore, our group down climbs the Gates to gather our skis. It’s at this point when one gets to truly enjoy the rewards of enduring the overnight sufferfest ascent. 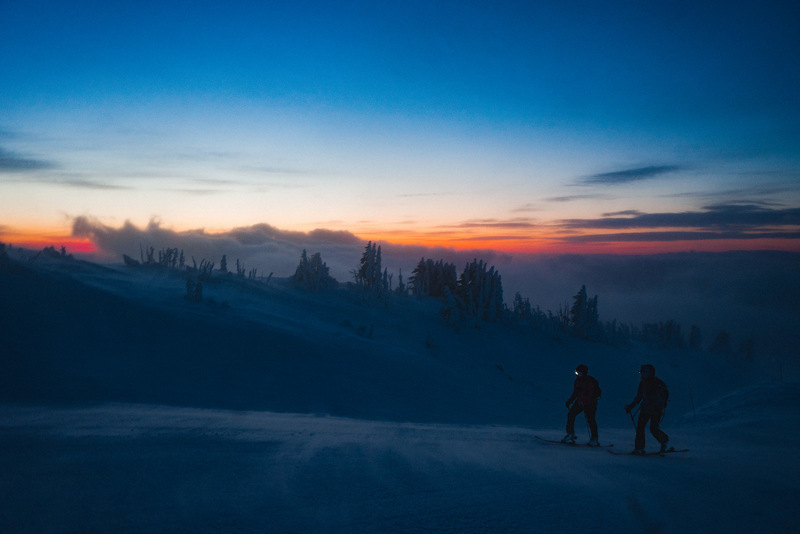 Skiing down from the Hogsback back to Timberline Lodge is roughly a 4,000ft descent. 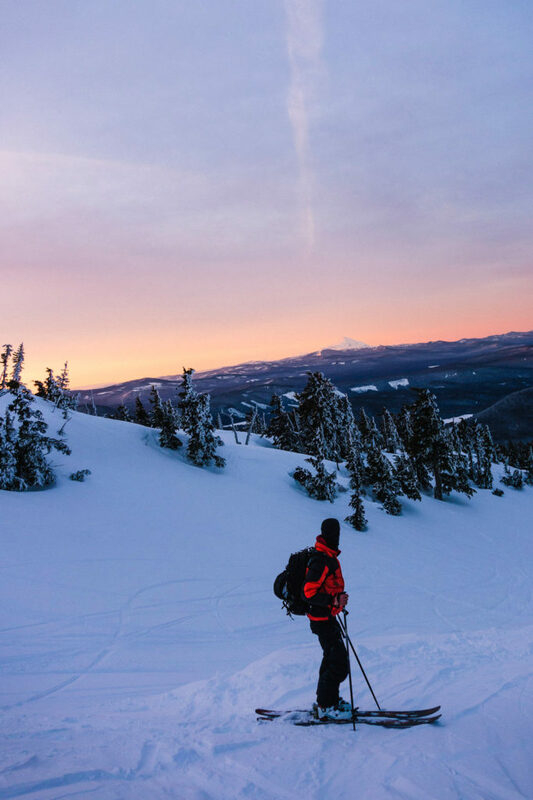 Additionally, if doing a spring summit, Mount Hood is known as one of the best mountains for spring corn, so the skiing is pretty fantastic all summit season long. With dead legs and endorphins charged from being atop the mountain peak, descending is like flying down back to the real world. Slowly entering the ski resort boundaries again, the chairlifts are beginning to turn on and the “early bird” skiers are getting ready for their first runs of the day. While on the other hand we are already taking off the skis, peeling off the socks and bearing the world’s dumbest, most exhausted grins. The short hour and a half drive back to Portland passes through the quiet town of Sandy, where a breakfast burrito and coffee stop is a basic necessity. Chowing down on some eggs and bacon while cruising back to the city, I can see the mountain still lingering in my rearview mirror. Even while in town enjoying reward beers, I can see the lone volcanic summit from afar, and I begin planning to do it all over again… probably next week.